I love it when someone takes data, and crafts a well designed, well thought out informative piece. The video below and the interactive website for “The Fallen of World War II” is one of those pieces. Designed and animated by Neil Halloran, this data visualization breaks down military and civilian casualties in the 6 year conflict and compares them to other military conflicts past and present. The information is presented in a straightforward fact driven way, that hooks the viewer and draws them in. Especially when you see the numbers in comparison to each country, and presented on the timeline. The interactive site, has a ticket price for admission. The recommended price is $2.50, and is completely worth the experience if you are into history, numbers, and data. The animated documentary runs just under 20 minutes, but is really worth watching. It’s a great lesson on the human cost of war, and mans inhumanity to man. It also points out some very interesting facts about who is fighting with whom since World War II ended. Posted in Animation, Design and Art and tagged Animation, Data, Data Visualization, Design, Neil Halloran, The Fallen of World War II, World War II on December 23, 2015 by Author. 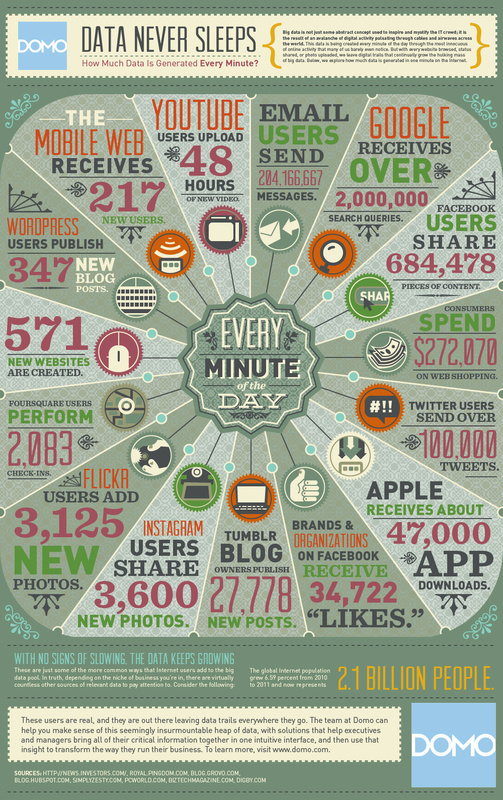 Every Minute of Every Day, Data Never Sleeps. Every Minute, of every day, of every year, the activity shown below is happening on the internet. In our connected world its a fact that data never sleeps, and there is no sign of things slowing down. In fact these numbers will get bigger as time marches forward. According to the infographic, in the time it took me to write this, 347 WordPress blog posts were pushed out to the web including mine. Posted in Design and Art, Information Graphics and tagged Data, Design, Domo, Infographic, Information Design, Internet on September 25, 2012 by Author.